Don’t let the fraudsters take your money! How would you like to double your money in the next month? If you are reading this in a good state of mind, your answer is probably “No thanks.” Not because doubling your money wouldn’t be great, but because you are thinking through the proposition rationally. However, sometimes the words fall on fertile ground, especially with older individuals. Perhaps they are feeling the pressure to have enough money in the bank to pay medical bills. Maybe they are experiencing money stress due to a job loss or a big tax bill coming due. Individual reasons will vary but the outcome is often the same: some fraudster becomes rich while a trusting retiree loses a good portion of their life’s savings. There are many investment fraud schemes that masquerade as the magic pill with the potential to solve all money problems quickly. Pump and dump schemes involve artificially inflating the price of an investment in order to sell off the same investment that had been purchased earlier at a lower price (this is commonly done with “penny stocks”). Private placement investments can be another avenue for peddling illegitimate scams because these offerings are not required to register with the SEC (and therefore aren’t subject to regulator scrutiny). Then there are the email pleas from overseas relatives of someone who left to them millions of dollars they can’t access unless you help them while they steal your money. Some scams are quite obvious. Others are elaborate enough to fool many reasonable people because they employ beautiful websites, lots of numbers, and charming salespeople. 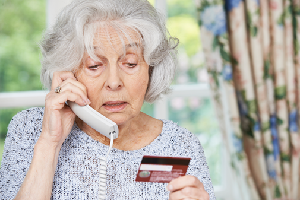 How can you protect yourself and your loved ones from falling for a scam? Here are four red flags to avoid! 1. Unsolicited offers are generally unsavory. Some of the tip-offs include promises to share “confidential information,” an upcoming favorable research report,” or secret news of a “prospective merger or acquisition” that the rest of the world doesn’t know about yet. 2. Claims of high returns with no risk. Remember that there is no free cheese, except in the mouse trap! Look out for words like “Safe as a CD” and “Guaranteed high return.” Remember that regulations prohibit legitimate financial advisors from guaranteeing investment results. 3. Aggressive sales tactics. If you are feeling the pressure to make a decision right now or miss the opportunity, it is probably designed to prevent you from consulting with family, friends, or honest professionals. Unscrupulous salespeople can get creative and downright scary, threatening dire consequences if you don’t sign up, or keeping you on the phone for hours to wear down your resolve. Remember that legitimate professionals are guided by a code of conduct that prohibits these tactics. 4. The caller has poor or no standing with the regulators. Ask the sales person what licenses he or she holds. Is he registered with the SEC, the state, or FINRA? Use online resources such as the FINRA Broker Check or the Investment Advisor Disclosure database to double-check anything you learn. And, of course, steer clear of the professionals who don’t have any license obligations. The most insidious part of investment schemes is that they often prey on our natural desire for financial security. This is why it’s so important to work with a trusted financial planner! Without a professional assessment of your savings and lifestyle, it’s hard to know for sure what your status and outlook are – which makes you an easy target for scare tactics. If you are determined to keep your hard-earned money (and to make sure your family members keep theirs), find a financial planner with whom to work. Educate yourself about common financial scams. Stay vigilant, because sometimes the unscrupulous offer might come from a friend who has been unknowingly fooled into parting with his or her savings. Take your time to do research and consult with professionals. Don’t ever be afraid to break off a phone call or an in-person chat that has turned into a pushy sales pitch. You may thank yourself later!